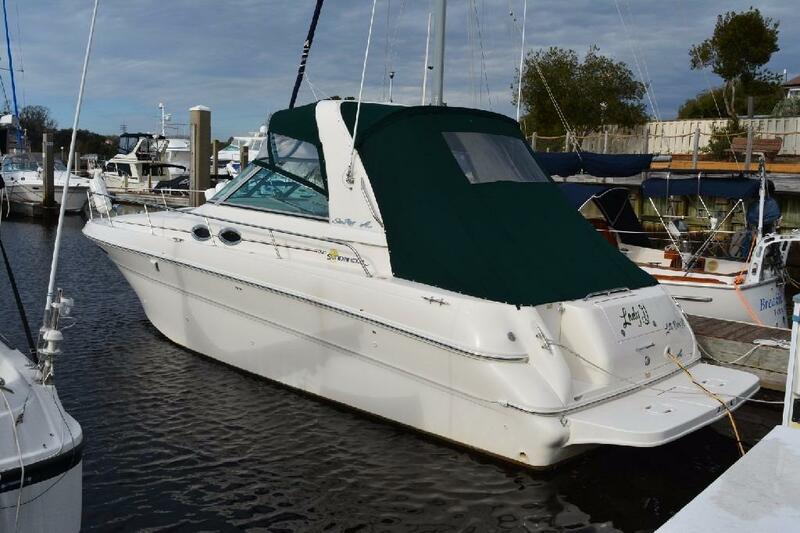 One of the more popular Express Cruisers for many years, the 310 Sundancer combines comfort and quality in a very well designed and efficient package that always compares favorably with her competition! 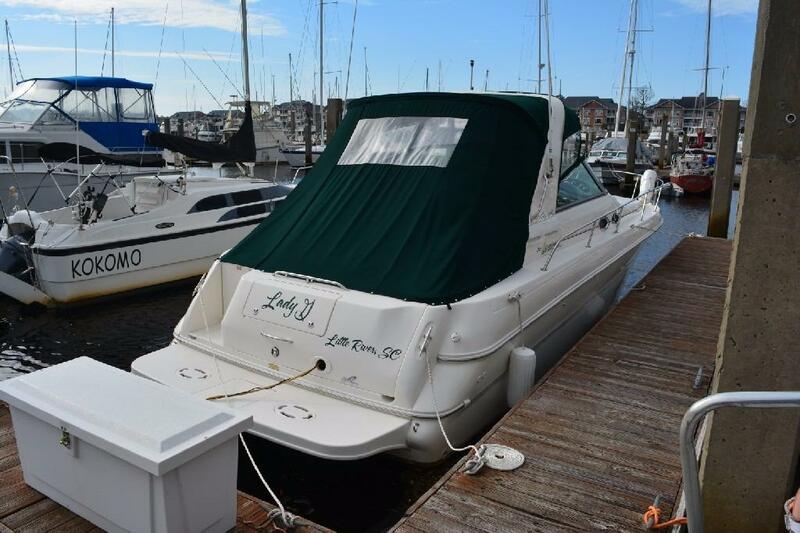 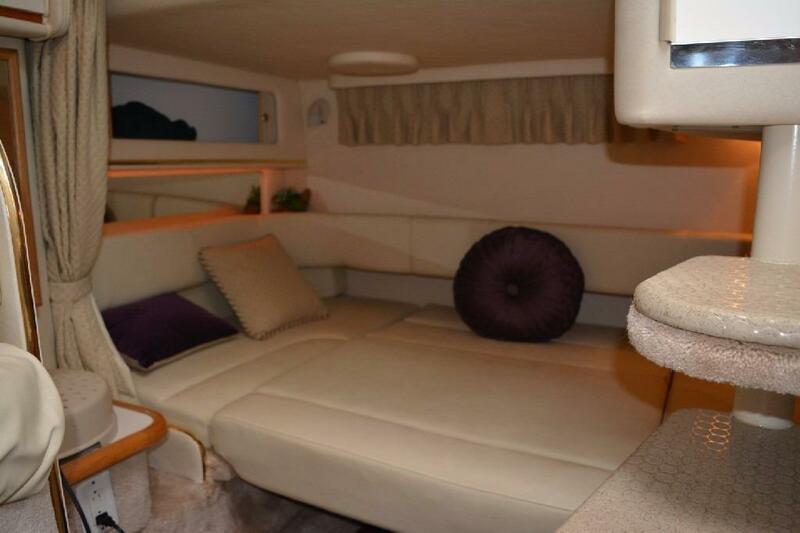 This 310 Sundancer is extremely well cared for by an owner with an 'open checkbook' philosophy. 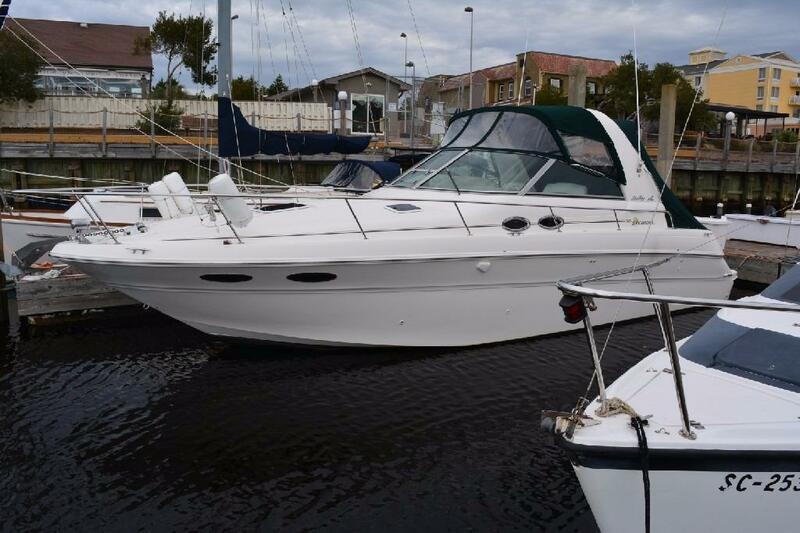 Powered by twin V-Drive MerCruiser 350 Mags with Closed Loop (Fresh Water) cooling she features include a 4.5 kW Westerbeke Generator. 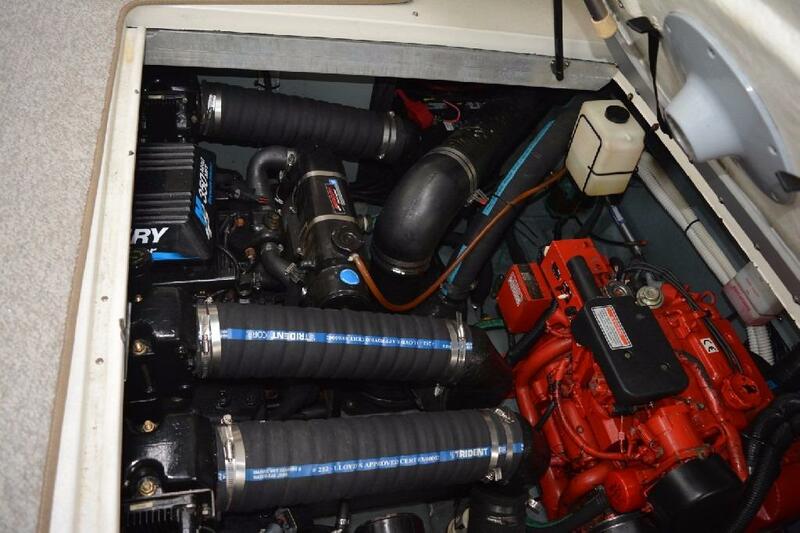 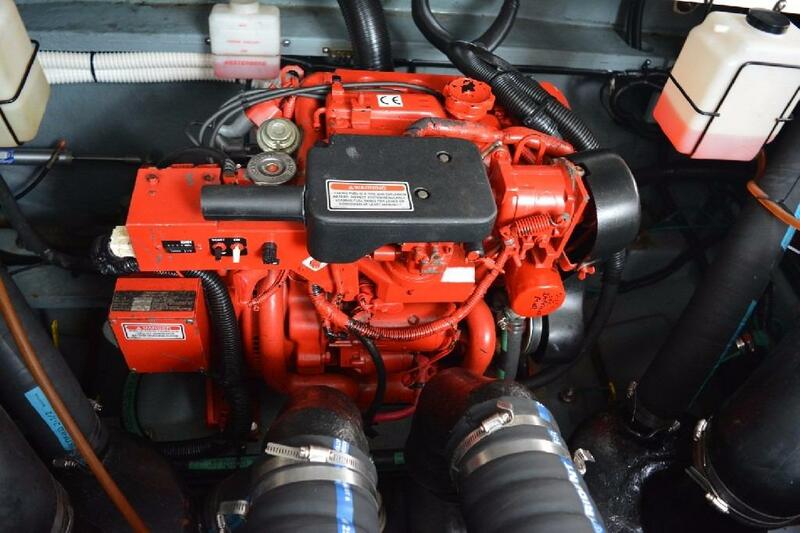 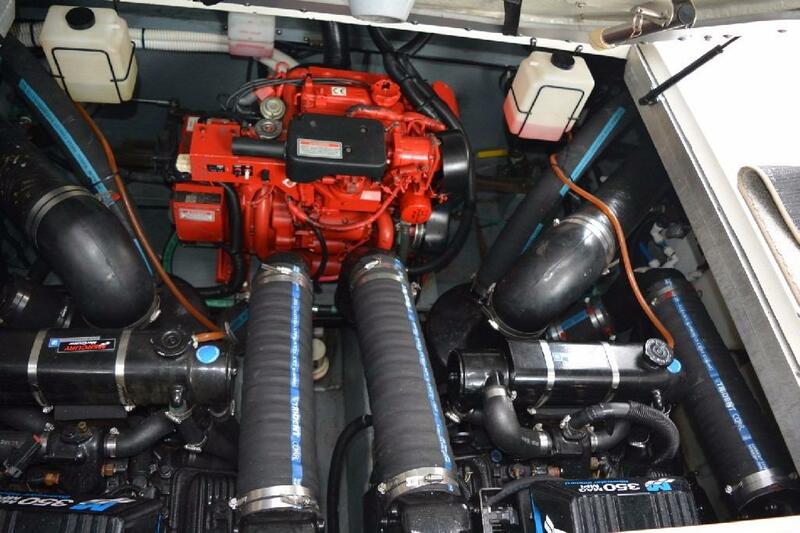 Her upgrades include Great Lakes canvas and new exhaust risers and manifolds. 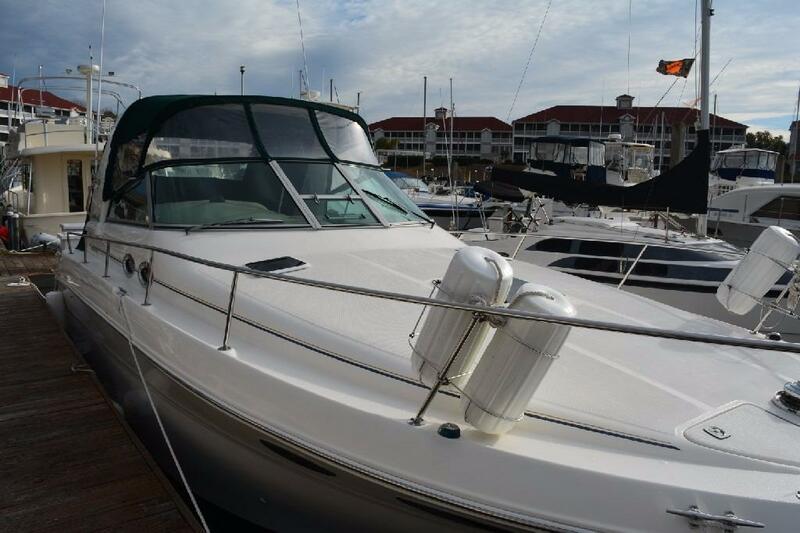 Buffed and waxed, this 310 is ready for summer action! 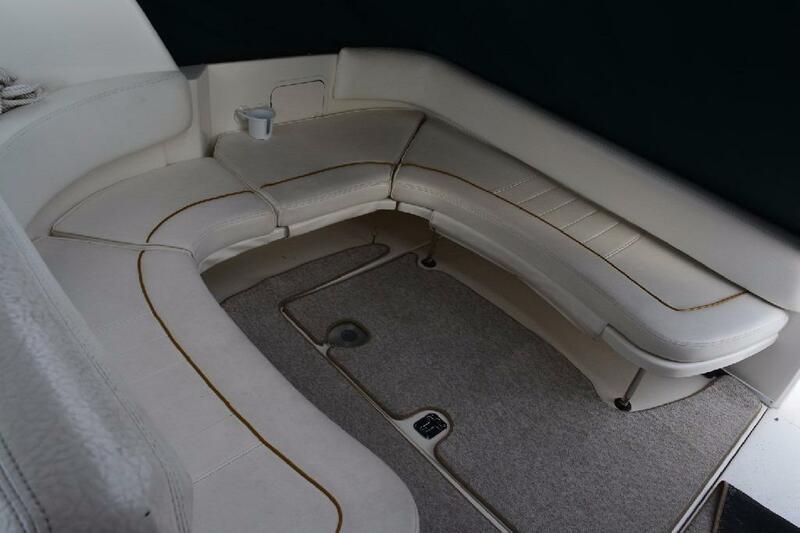 Please check the FULL SPECS for more details and give us a call to schedule an appointment to see this one soon! 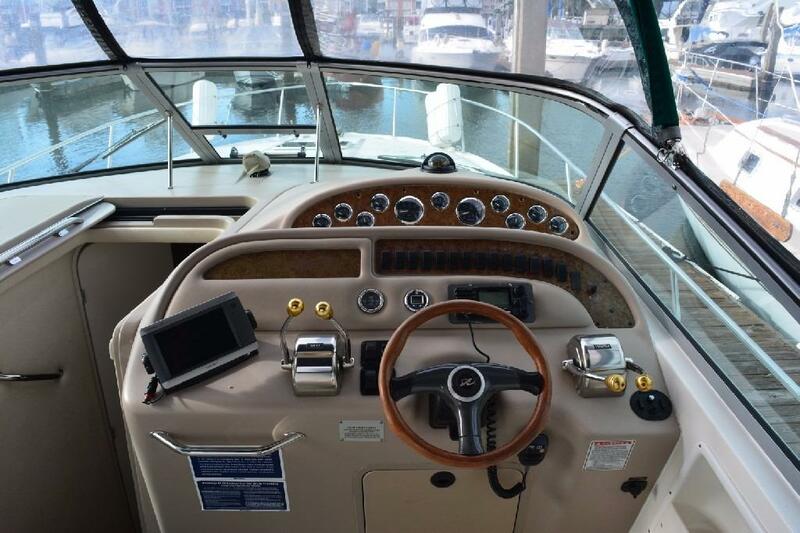 The weekends are all too short, so to help pack in all the recreation and relaxation anyone can handle, there's the Sea Ray 310 Sundancer - the sport cruiser with all the features, fun, and fuel capacity needed to get away from it all. 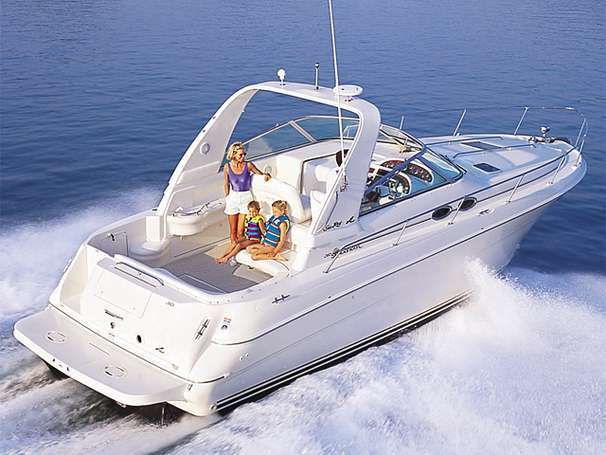 With a walk-through transom, extended swim platform, and a cockpit with everything from a wet bar and cooler to a stylish forward-facing fiberglass sport spoiler for easy entry at the dock, the 310 Sundancer is engineered for good times. 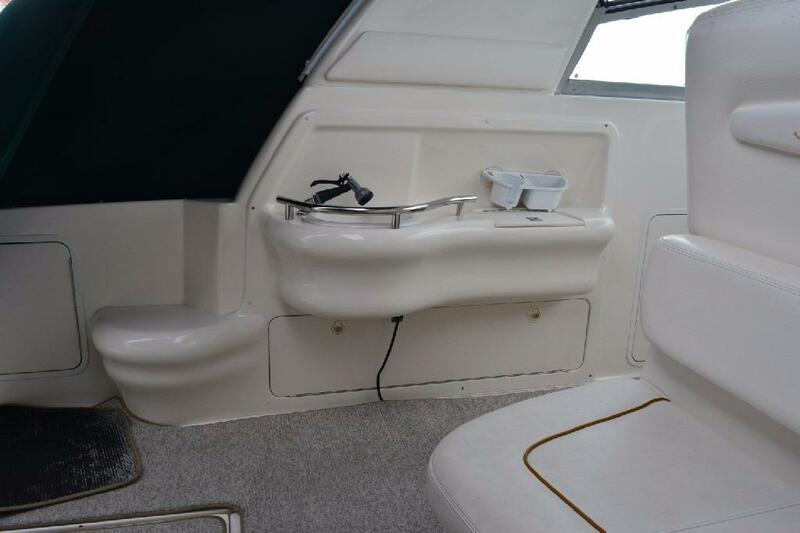 A custom adjustable helm seat, a companion bench seat with aft-facing bench seat, plus a full aft bench seat all make sure there's plenty of room for everyone. 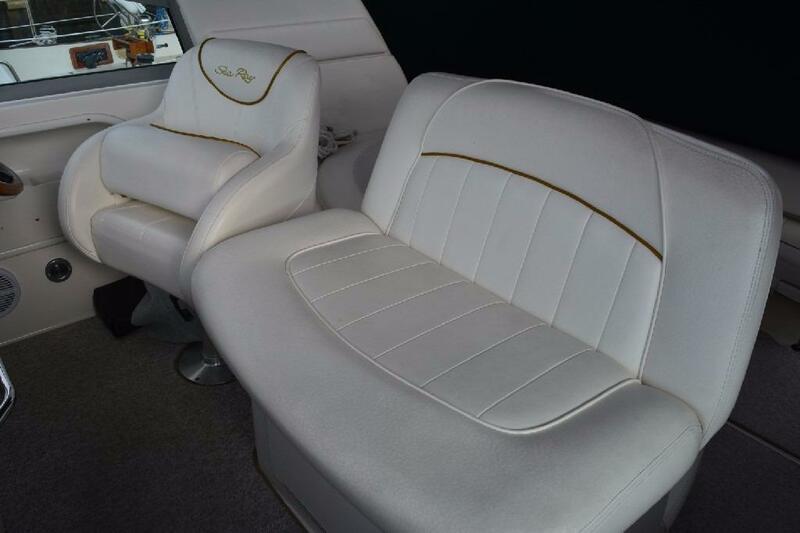 Sea Ray provides an enormous amount of storage space in the cockpit side panels and below the companion seat. 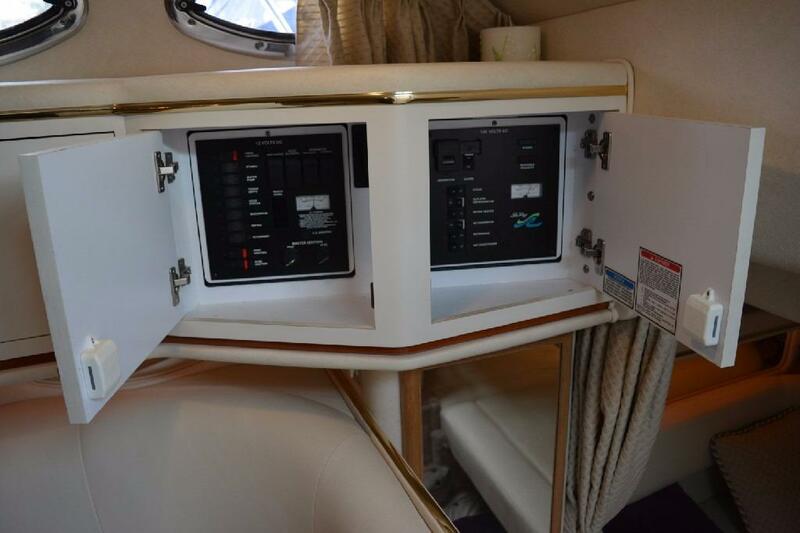 With the fender storage in the aft wall there's also concealed water and dockside power hookups. 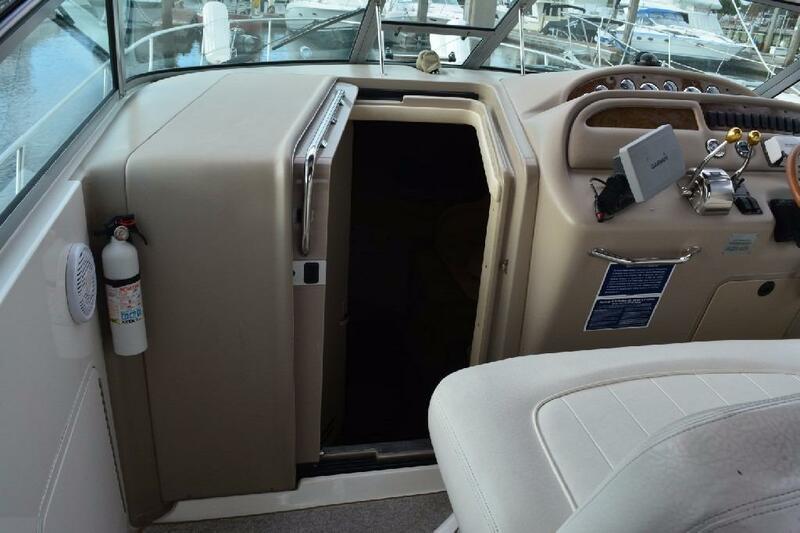 Even maintenance is no problem courtesy of the self-bailing fiberglass cockpit liner, snap-in carpet liner and freshwater washdown with hot and cold cockpit shower. 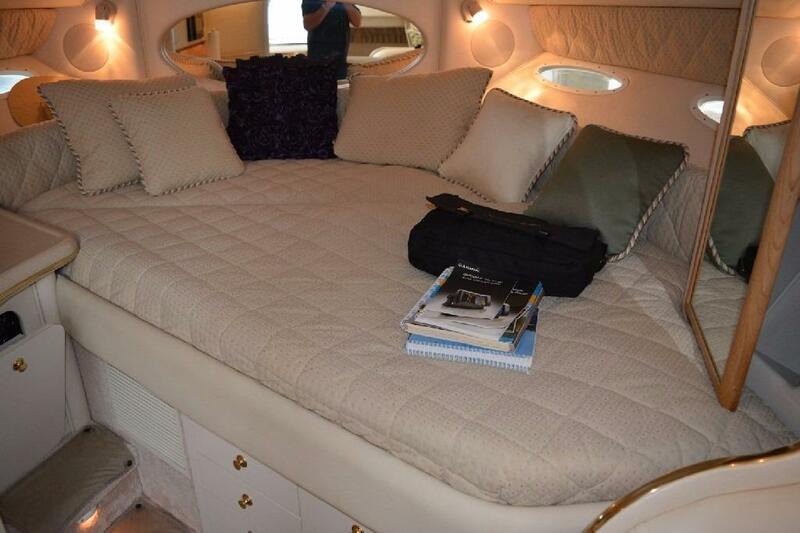 Below deck, the cabin of the 310 Sundancer reflects the same attention to detail. 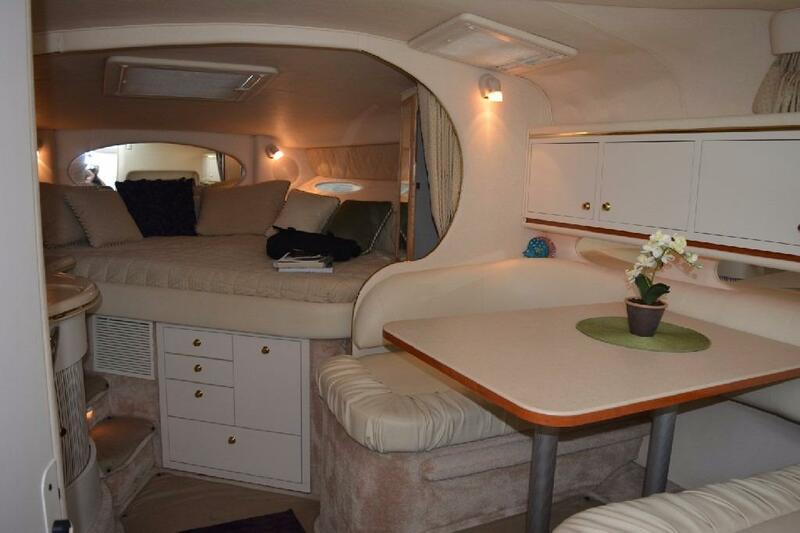 40-ounce stain-resistant carpet, interior Sunbrella carpet runners, and floor and gunwale cabinet storage. 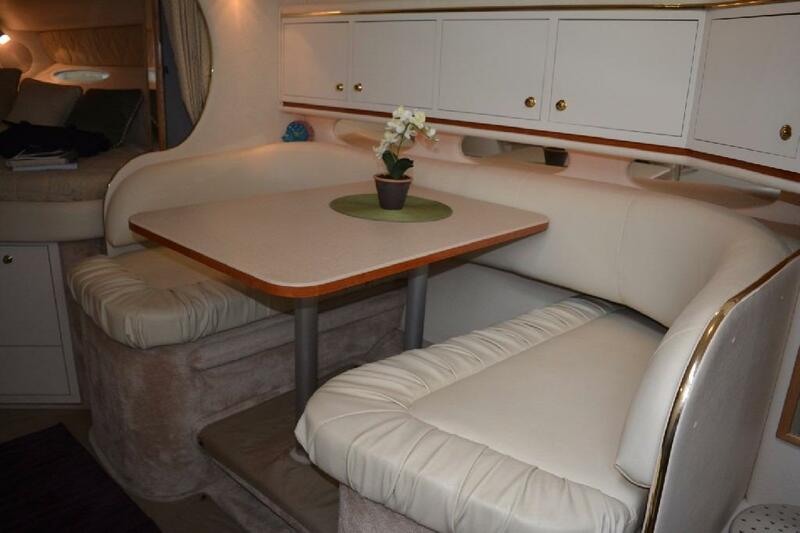 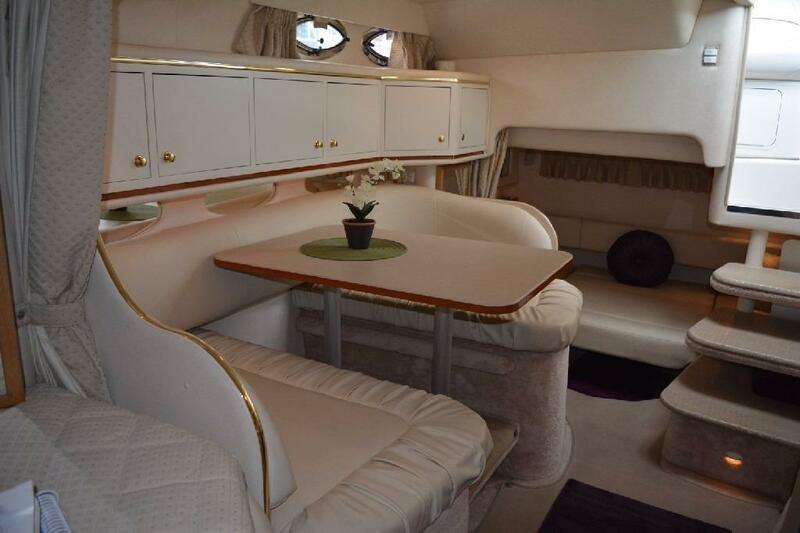 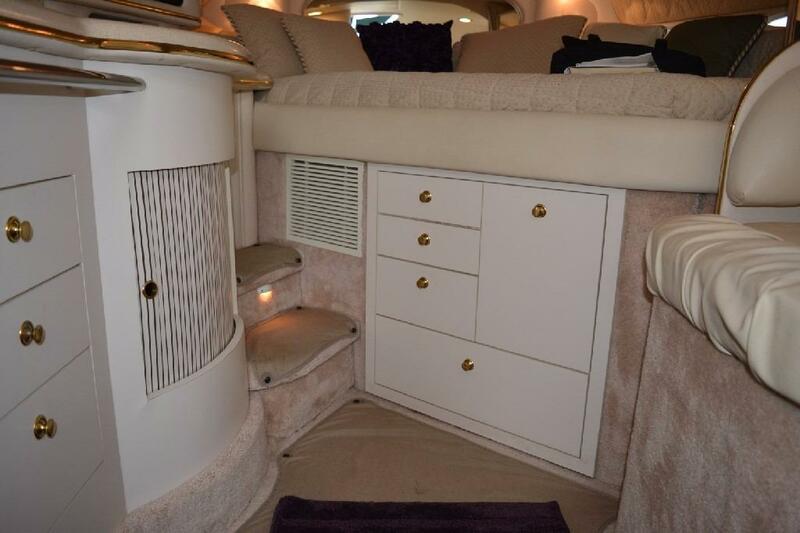 In the salon area, there's a convertible dinette with mirrored accents opposite the galley. 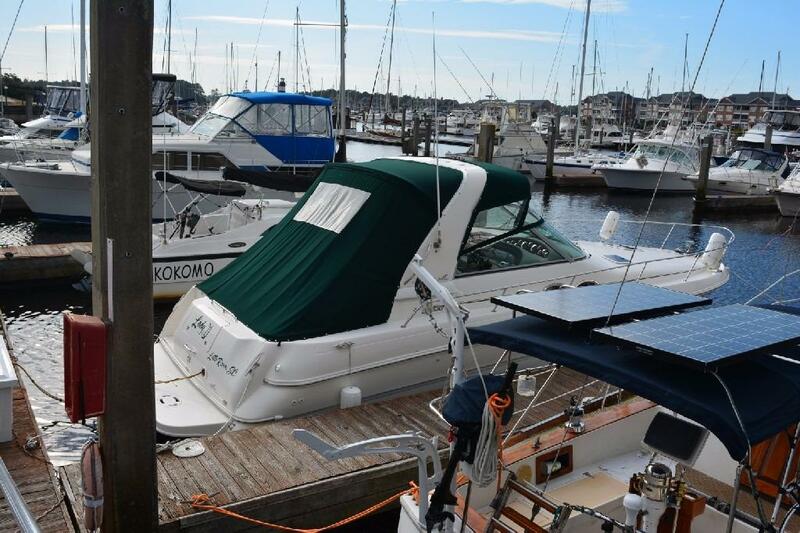 The forward raised V-berth offers plenty of sleeping and storage space with a hanging locker, gunwale shelf, and a portside storage cabinet, shelf and flip-out drawer. 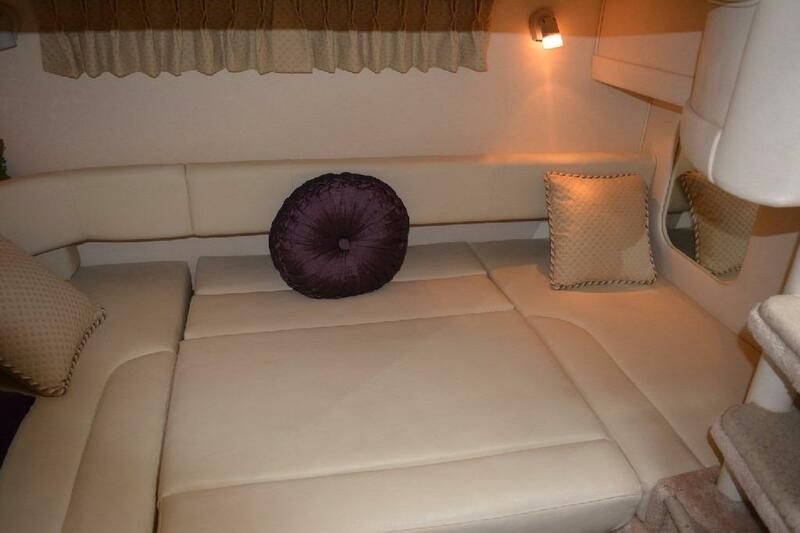 The mid-stateroom serves as a salon area, then at nightfall, slide the privacy curtain closed and it sleeps two in a convertible double bunk with sliding base and filler cushion storage. 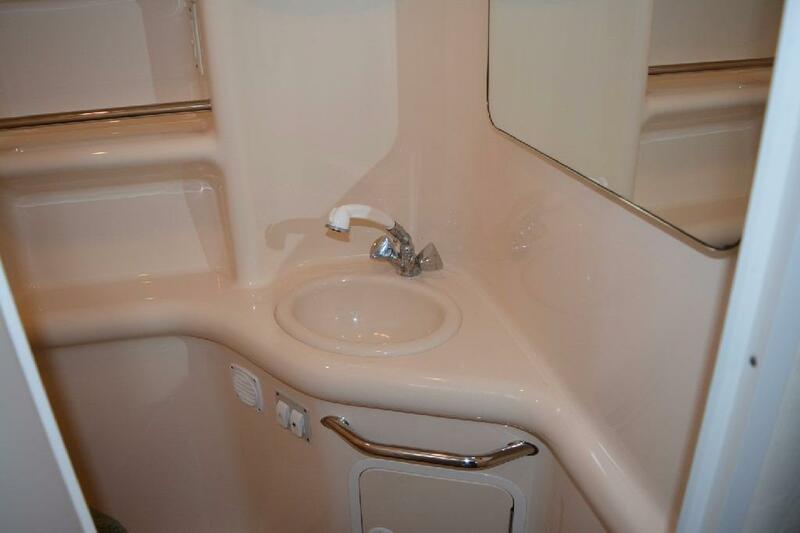 And guests can put away all their personal articles in a convenient hanging locker with vanity top. 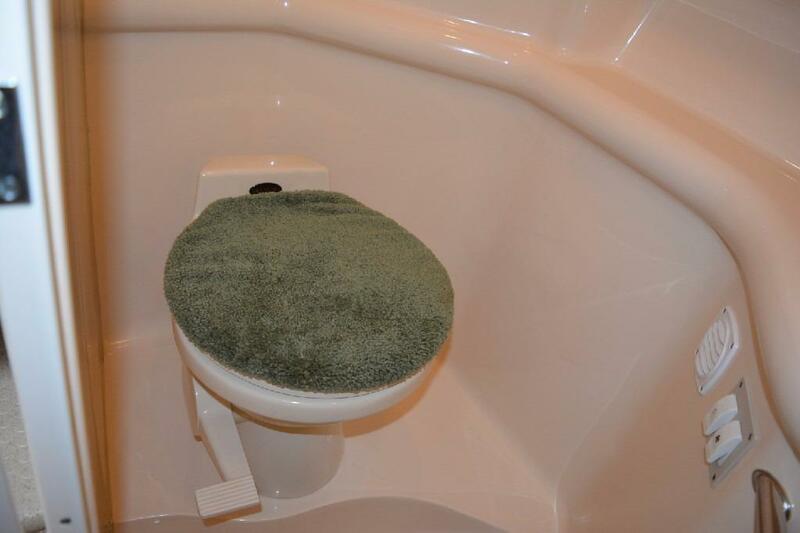 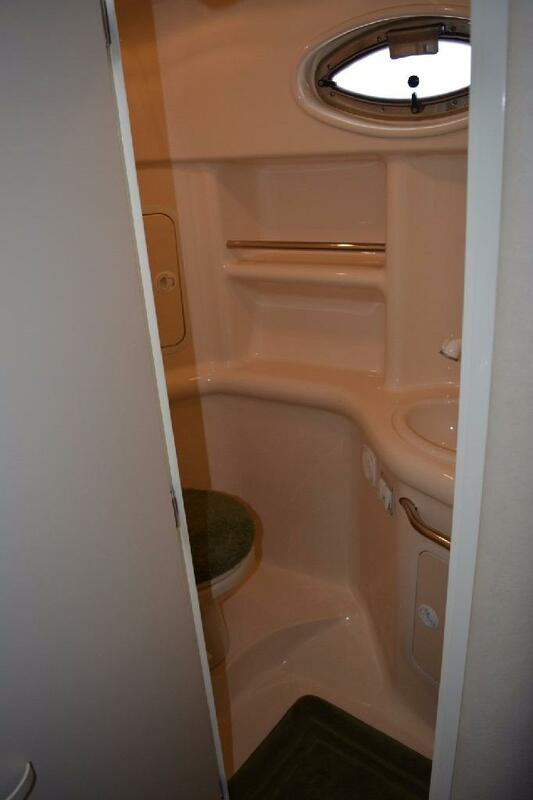 The standup head area is fully enclosed and features a shower, sink, and VacuFlush toilet. 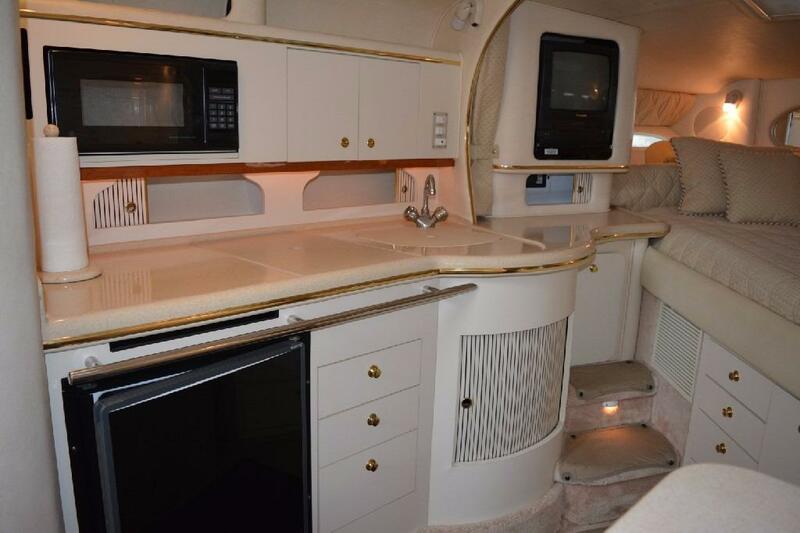 Of course, even the most die-hard traveler would be lost without a full-service galley, including a space-saving recessed two-burner electric stove, recessed sink, microwave, and refrigerator. 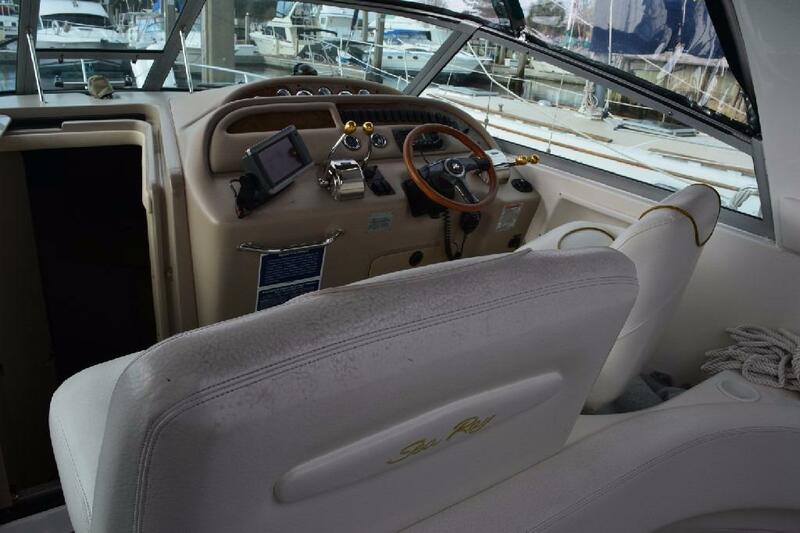 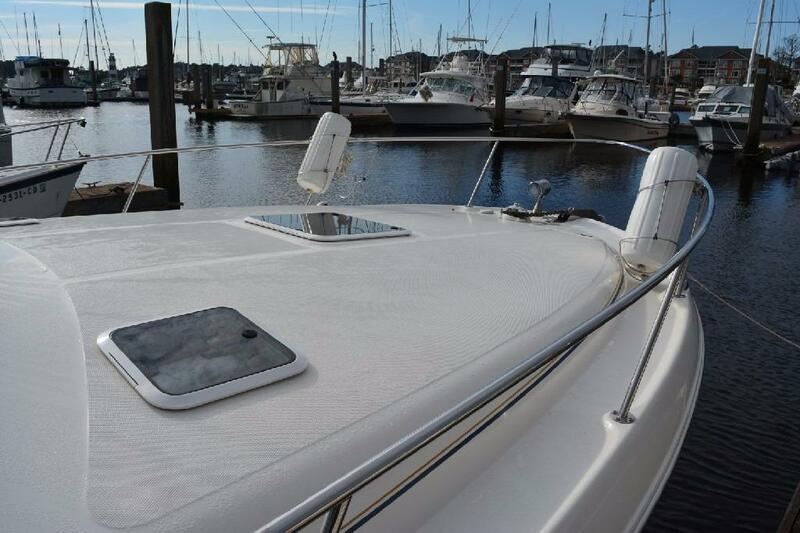 Sea Ray even added a Clarion AM-FM digital cassette stereo with amplifier, six-disc CD changer, six speakers and cockpit remote control, just to make sure the comforts of home are never left too far behind.